The actor, writer and director of the U.S. verison of The Office has written a book. A collection of short stories ranging from the bold, the lost and the romantic. The thing about short stories is you either love it, you feel indifference or you hate it. It is hard to keep an audience interested in the stories because it is truly a talent to create a memorable and emotional piece of work. With that being said this collection was a miss for me. 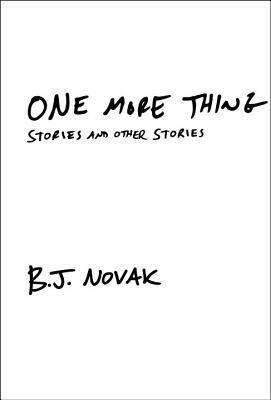 Before reading this book it was stated that Novak is the new voice of American fiction and that his humor on screen comes completely through in this collection. I disagree. Novak has a good foundation in each of his stories and some humor. However, although the stories show that he is creative on the sense of coming up with an idea, his writing talent needs to be developed more. None of his stories made me want more, which is a good and bad thing. It is good because that means he was able to conclude the story successfully without me being pissed off (this is a constant issue I have with short stories). It is a bad thing because I was able to speed through the book without having any attachment to any story. This collections was a good effort but the actual art of storytelling (invoking interest, curiosity, suspense and other emotions as ell as effort).